Sitting in a prime window niche at Sun Peaks Lodge having breakfast, watching people skiing down Main Street among the Tyrolean buildings towards the ski lift hub just 50 yards from my centrally-situated hotel. I’ll be out there joining them in half an hour but for now it’s a vicarious pleasure watching their Peak and Patagonia progress towards ski school and sensing their anticipation. My plan is a downhill day on the sunny slopes with Mayor Al Raine with coffee at Bolacco’s with Sun Peak’s skiing - and Senate - sensation, Nancy Greene Raine. If you have never been to Sun Peaks, you must include it on your wintersports wishlist (and summer scenery bucket list). Wow factors are immediate from its authentic Austrian architecture to the horseshoe-shaped slopes surrounding the village. 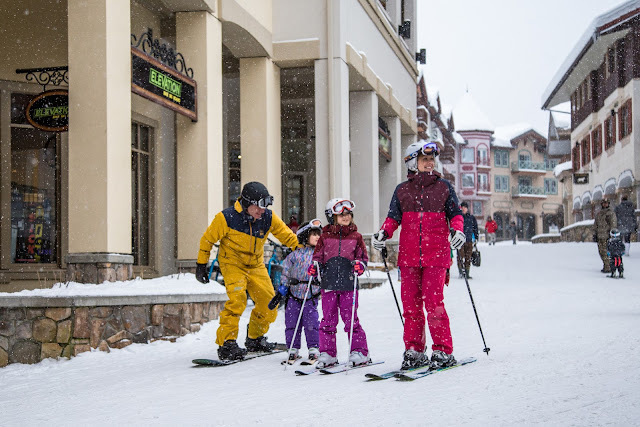 The central Main Street is wide enough for horse-drawn carriages, groomed for skiing to hotels, restaurants, bars and shops as well as to the ski lifts. 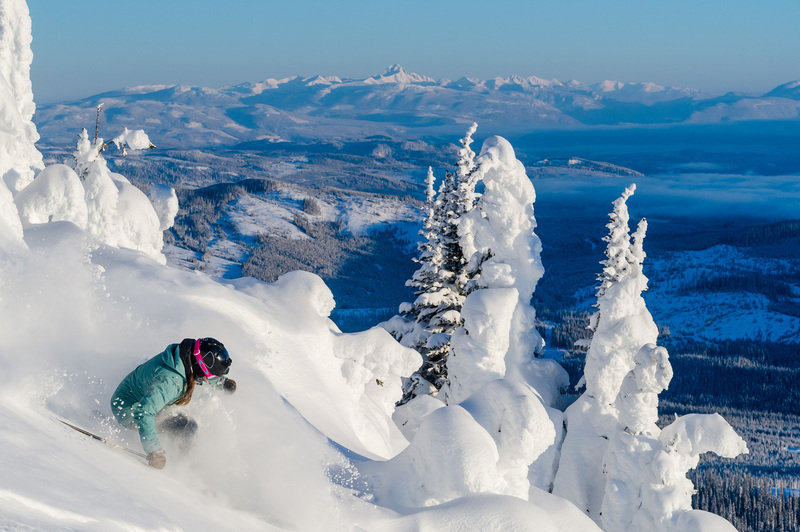 The whole village is uniquely wrapped on three sides by the 4,270 acres of the ski map – the second largest ski area in Canada. With around 400,000 skier visits per winter and a resident population climbing towards 900, real estate prices are on the up with bidding wars starting over commodious condos and tantalizing townhomes. 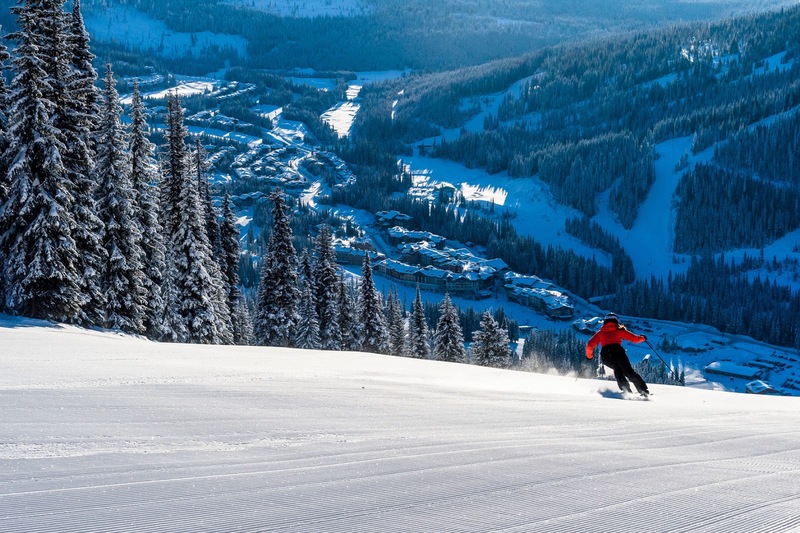 The town’s progress has been pioneered since 2010 by Mayor Al Raine, who has a varied background in ski racing, coaching and ski resort development. 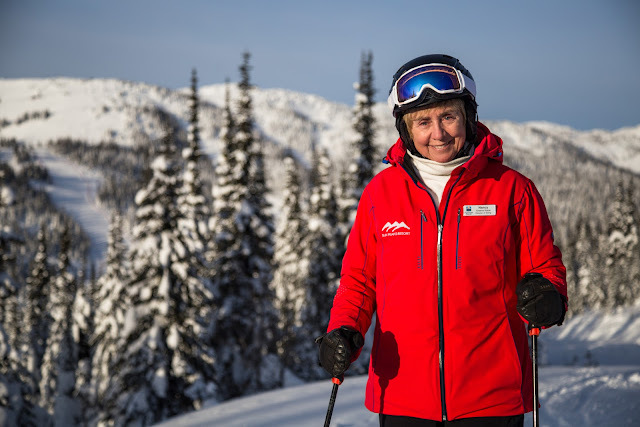 Always at his side, is wife and partner, Canada’s most recent Tourism Hall of Fame inductee and Olympic Champion, Nancy Greene Raine. With this kind of ski royalty at the helm, this ritzy-rural resort is being sensibly steered to create the perfect balance between residency and tourism needs. That first day we skied 9-2 with Al – it might be his last term as Mayor, but he still has oodles of energy! So slick and fast on his all-mountain skis, he’s impossible to catch or overtake. 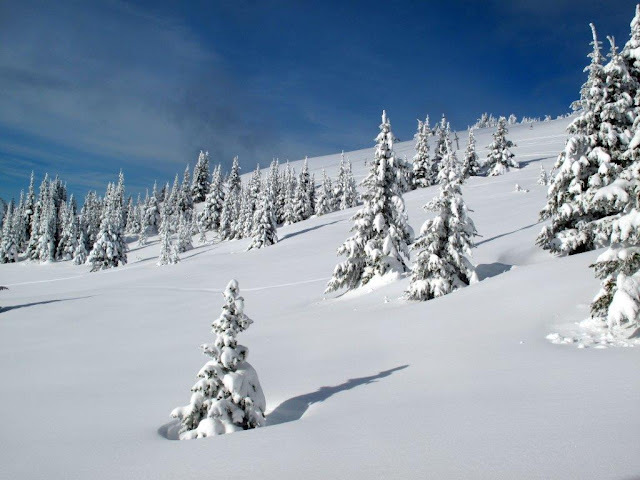 He was just recovering, he said, from a weekend of being skied out by his two grandsons who had come up from nearby Vernon. Mid-morning we had a coffee stop at locals’ fave, Bolacco’s to catch up with Nancy who had errands to run that day. Bolacco’s, tucked away in the lower level of the Sundance Coast Hotel since 1997, is favoured by the resort’s Aussie population drawn by the authentic Italian coffees. Full of ideas, potential projects, and acute observations, Nancy looked exactly the same as when we last saw her around 10 years ago. I want some of that mountain lifestyle to make me stay so lively and youthful! Al had been recently watching a professional technician from Switzerland – one of the only people in the trade who can do this - splicing the cable for a new lift about to be launched for Christmas holidays. “They literally have to trim some of the threads from each end of the cable and then weave the remaining threads to make a perfect join,” Al described. Sounded like vein or artery surgery to me – and just as important! The new quad chair is only going up to the halfway mark this season but will go even higher in the future - guaranteeing that newer developments in the upper village will be ski in/ski out. Really important to keep that concept for all new accommodation here. New this season, too, is the trendy pod hostel, The Burfield; basic but beautifully furnished and finished, it also has suites and will be joined by a sister building next season. 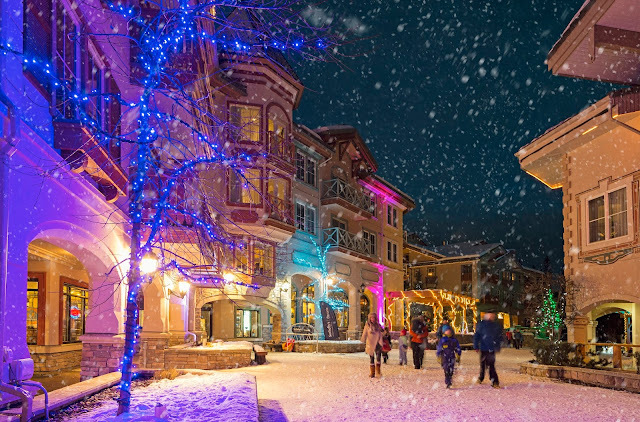 To feel part of the history and persona of Sun Peaks, you can stay at the Nancy Greene Cahilty Hotel & Suites – Al and Nancy’s original condo-style hotel with 168 rooms which they built and operated. They still live there and also have a home in Kamloops. There’s a neat museum display of all Nancy’s racing achievements and also regular Sunday Welcome Receptions for visitors to meet both her and Al. Second day we got to ski for an hour with Ski School Technical Director Ron Betts. 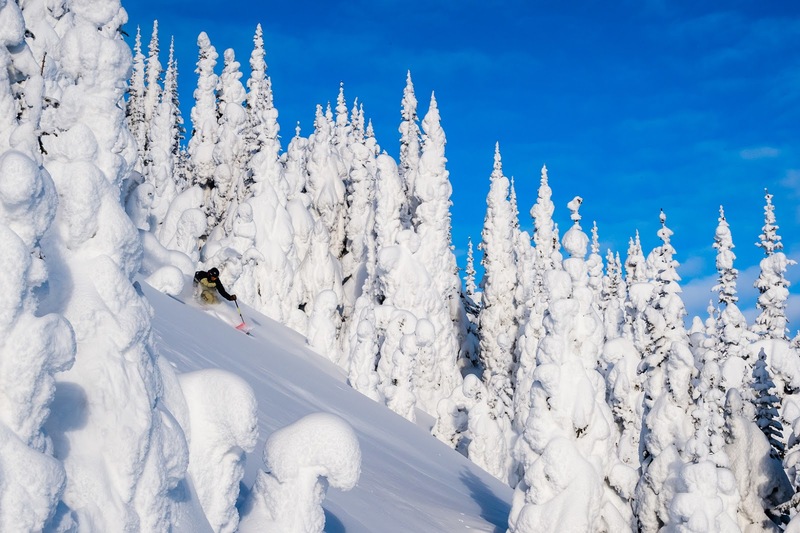 His peak pedigree encompasses 17 years with Mike Wiegele Heliskiing and 15 years with SilverStar, before moving to Kamloops – the nearest big town to Sun Peaks - where his wife is from. A fellow writer for Ski Canada magazine, Ron met editor Iain MacMillan while working for Wiegele and went on to document gear testing for four years. If you’re a Ski Canada reader, you’ll recognise him as a regular feature writer, including a Crans Montana article in the 47th #2 issue. Ripping up some gentle pow on the Morrissey area, I could see that Ron has a similar quirky sense of humour to Iain – you can detect it in his writing as well as his personality on the hill. 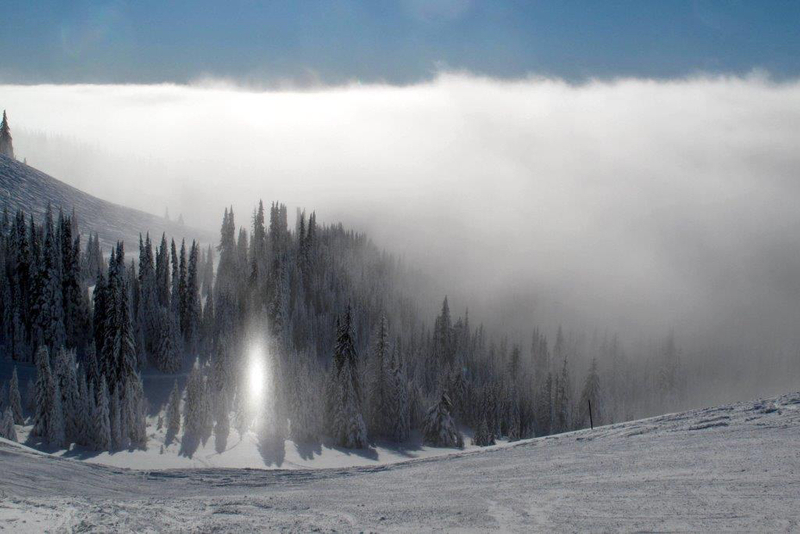 While sharing a chairlift with a renowned Sun Peaks’ skier, Ron pounced on the potential interviewee, employing all his powers of persuasion. But the guy turned the tables, asking us questions instead, and declining immortality in SPIN on the premise that it “might jeopardize a future run for political office”. The next day we skied with Anne Terwiel - a CSIA Level 4 ski instructor at Sun Peaks, ski tester for Ski Canada mag, and a professor at Thompson Rivers University at Kamloops. Coincidentally, she is considering using our book, Winter Sport Tourism for her new mountain adventure course coming to TRU next semester. If her tourism teaching is anything like her swift-but-smooth skiing, then she must be a very motivational and accomplished prof.
Dinner that night was with local Rachel Roberts - who works as Media Relations and Communications Specialist for Tourism Sun Peaks - at the sizzling Steakhouse at Sun Peaks Lodge. 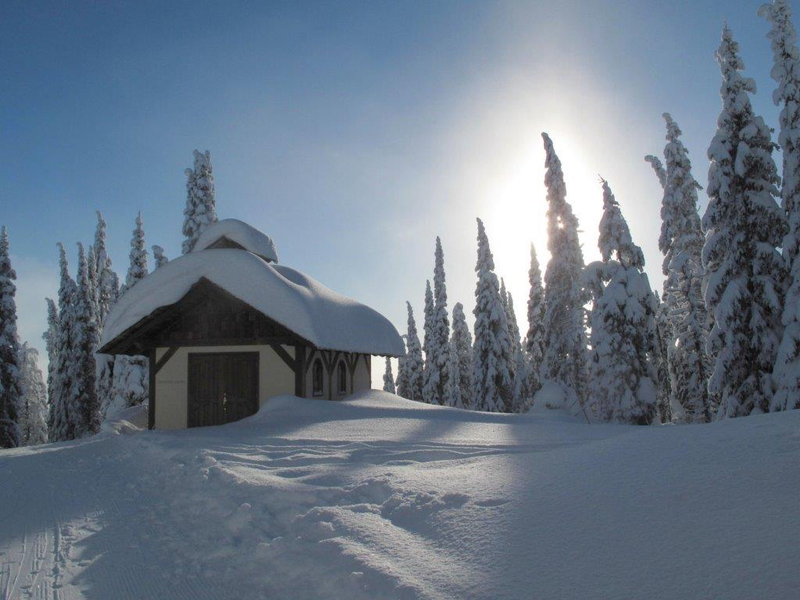 The Sun Peaks Lodge, itself, epitomizes the resort’s Tyrolean theme, designed by Ecosign’s Paul Mathews, with a delightful European feel from the chalet-style exterior to the charming olde-worlde ambiance and the German accents of the owners. We indulged in a feast of fabulous cheeses and charcuterie, followed by tender Canadian beef tenderloin medallions with beautiful BC wines, including a full bodied cab sav from Black Sage Vineyards. Having a gluten-free vegan with us didn’t faze the meat specialists - they customized the risotto for him, adding lots of vegetables. Although they couldn’t help with vegan desserts, next morning Rupert was able to find a GF vegan brownie at Vertical Café which is really specializing in today’s new food and wellness trends – for example, paleo powershots, energy bowls, and chocolate quinoa cake. 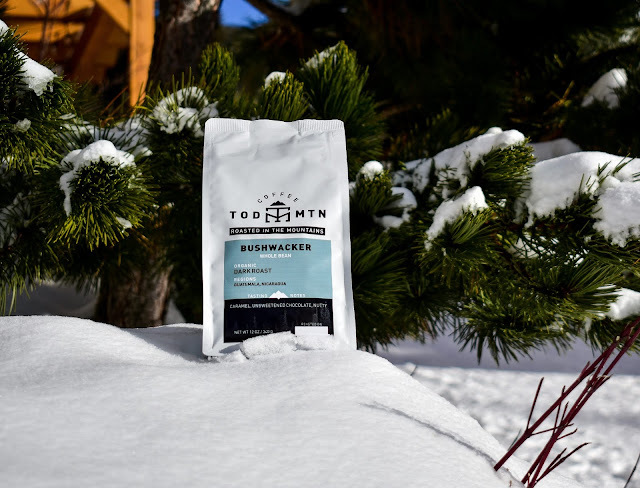 We also found gluten-free pizza later that week at Mountain High and GF handcrafted crepes at Tod Mountain Café – Tod Mountain being the original name of the resort before becoming Sun Peaks. One of my fave places to après was Cahilty Creek Kitchen and Taproom. 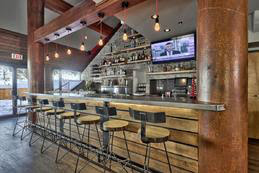 Recently refurbished with a modern motif of metal, wood and grey tiles, it has $5.50 appies, sliders, fried tofu, and drinks during the 120-minute ‘happy hour’. Very animated and friendly, the upgraded décor really stood out, especially the horizontal wood cladding and grey marbly subway tiles around the bar (which has wine on tap) and the revamped washrooms sporting lovely jeweled soap dispensers, square sinks, and more trendy tiling. As you can tell, I’m an HGTV addict! What would a ski resort be without an Irish pub? 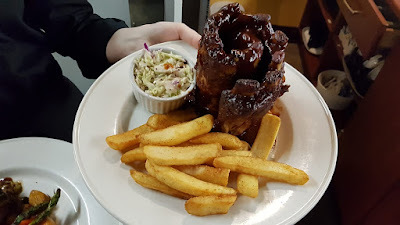 Sun Peaks has Morrisey’s which attracts local workers with its lively comedy nights, pub fare (including amazing fries: crinkly and to crave for), and the usual array of beers and bottles. Bottoms is another youthful hangout, with a panoramic patio right off the slopes at the main gondola base. “The cheapest wine in town,” said Sydney, the chatty bar server. The people next to us were drinking tequila bowls with upside down beer bottles in them – what I discovered were called Bulldogs. It looked as lethal as it sounds – a Mexico beach party on the pistes. For dinner, it took us a couple of nights to get a table, but Powder Hounds was worth the wait – particularly the curry which had the vital vegan and GF allure for my son. 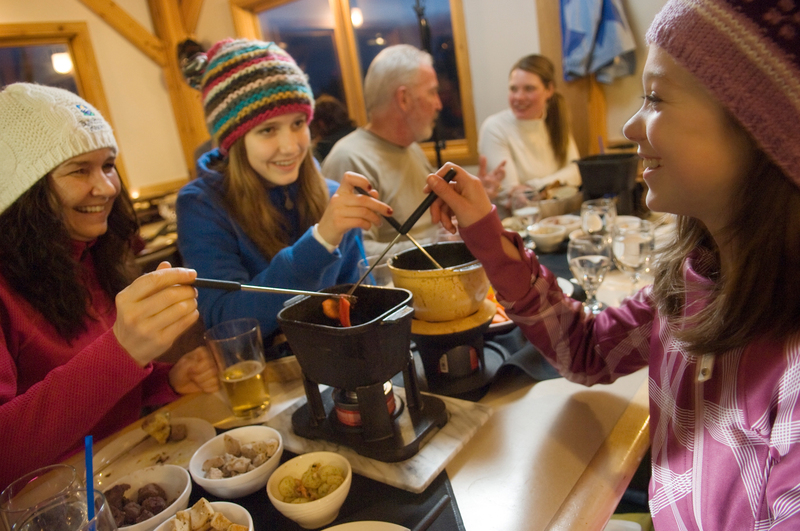 My absolute favourite meal at Sun Peaks, though, was the three-course fondue up the mountain at Sunburst Lodge. Reached by a 6pm gondola, it really is three courses of fondue: big cheese fondue starter, followed by fondue chinoise with various meats; and then chocolate fondue with fruit and shortbread dippers for dessert. The speed of the ski down should have been augmented by the weight of all that food, but I think we were all being careful due to the darkness and the amount of vino consumed at the convivial communal table with a Brit, Canadians and Kiwi mix. 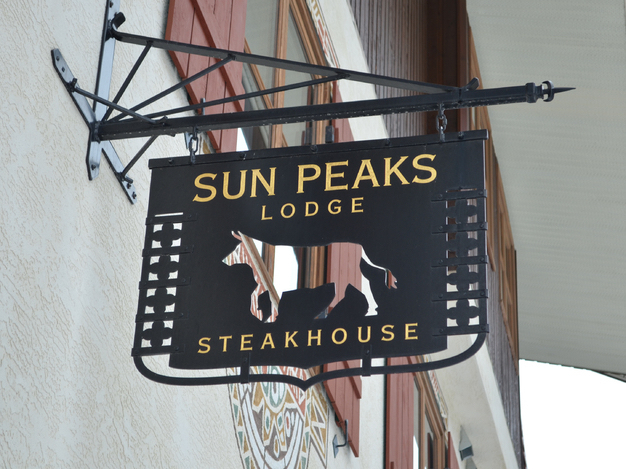 The Sun Peaks Grand dominates Main Street, with the sumptuous entrance near the ski slopes and the hotel rooms and residences stretching from Mantles to Morriseys. We went in for the Artisan Holiday Market and were entranced by the grandeur of the two-floor foyer linked by a sweeping staircase, ancestral-home motif, ancient looking pillars and flagstones, huge chandeliers and fabulous fireplaces. 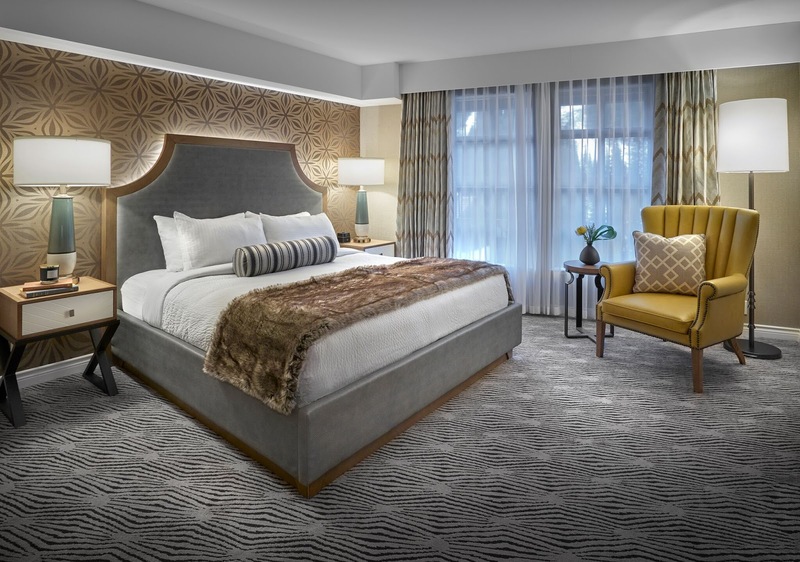 Originally a Delta, it was bought by the owners of Sun Peaks four seasons ago and they’ve already spent a fortune on the 200-plus room renovations. We got to check out the room renos, all done in a modern grey/cream/natural colour palette, with fur throws decadently decorating the beds, and marble accents. The two-bedroom suite with full kitchen and dining room was definitely a winner, with enviable views onto the slopes. Could certainly imagine spending a very luxurious entire season there, hosting a grand Christmas dinner for the whole family, having guests visit regularly, throwing cocktail parties for locals. Dream on: at $300 per night, one can only imagine what it would be for the whole season! Show me the workers’ accom so I can get real!! Another fun evening activity is the Cat Trax Groomer Ride which I did with Sun Peaks’ youngest groomer, Lukas Meertens. Just 18, Lukas loves his job – especially the 2pm to midnight shift to which he was promoted after completing his snowmaking apprenticeship on the more arduous midnight to 10am shift. Son of Sun Peaks’ Mountain Operations Manager, Lukas has already had an impressive five years’ experience working as a liftie and has been traveling in snowcats all his life. “Ever since I was young, it has been a dream of mine to get in one of these things as the driver. I have been doing it as a passenger with my dad since I was a baby of one or two. The other operators are all older than me, in their 30s, and they say they are grown men in big toys” – so, I guess I got the ‘toy boy’. Despite reservations about his experience, I was impressed with his professionalism and ability with the monstrous machine. Totally immersed in his operations career, he’s also an expert in snowcat techie trivia. His short term ambition: to groom during a full moon. And longer term: to move up the ladder to winch cats on the steeper slopes like Sting and Spillway which I had skied that day. “It’ll be three years of driving free cats though before I can move on to winch cats,” he explained. 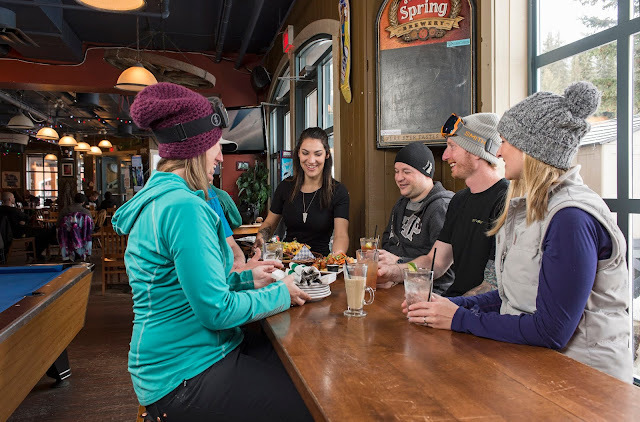 With a complete menu makeover - featuring veggie burgers with GF buns and caramelized onions, guacamole, mac and cheese with short ribs and a sensational goats cheese salad - Masa’s was a fun spot for a leisurely loquacious lunch with Aidan Kelly, Chief Marketing Officer at Sun Peaks. Right by ski school, it’s easy to drop in during or after a ski day. 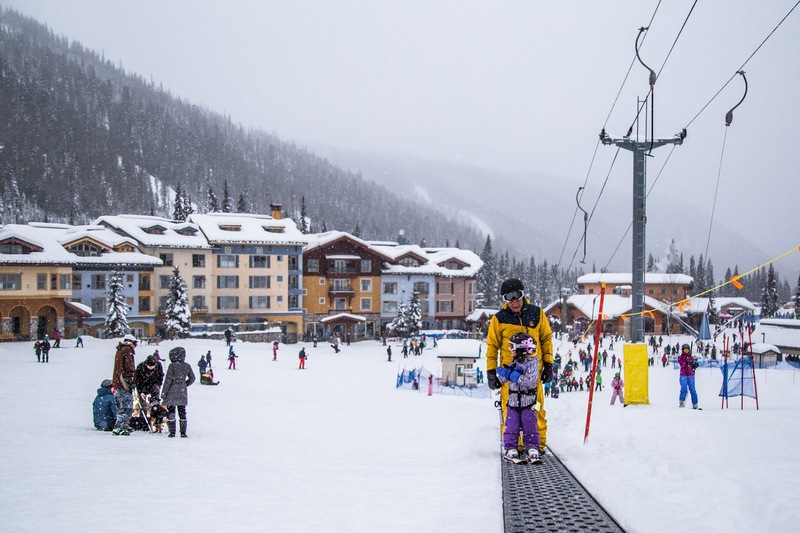 Aidan used to ski at Sun Peaks as a visitor but has now been working there for five years. With a background in business and tourism marketing, general management, event promotion and execution, he instantly discovered a ski hill home truth: “Transitioning from general tourism to the ski world, I realized that it doesn’t matter if I am the smartest marketer in the world, it is all about the snow.” All ski resorts across BC, he contends, are somewhat dependent on the snow conditions at high-profile Whistler as the perception is that whatever Whistler has will be the same across BC. 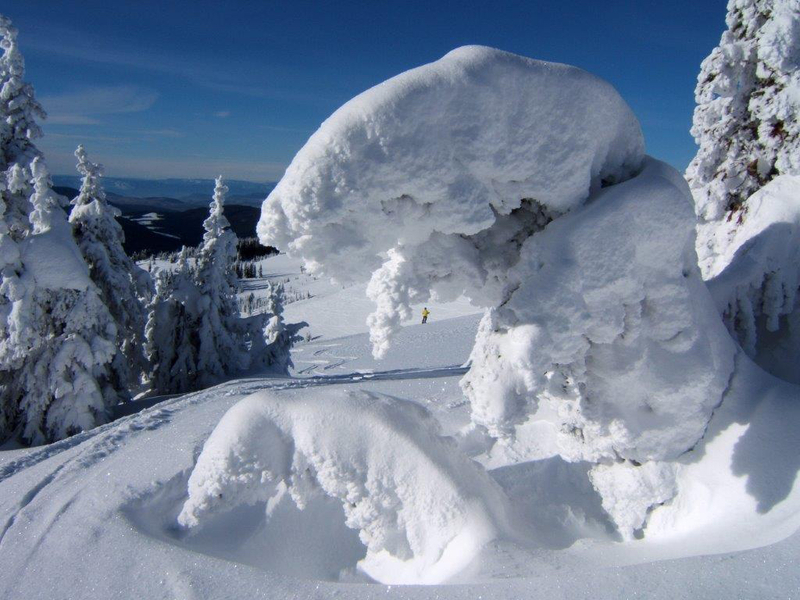 However, the weather and snowfall is actually very regional across the mountainous province. 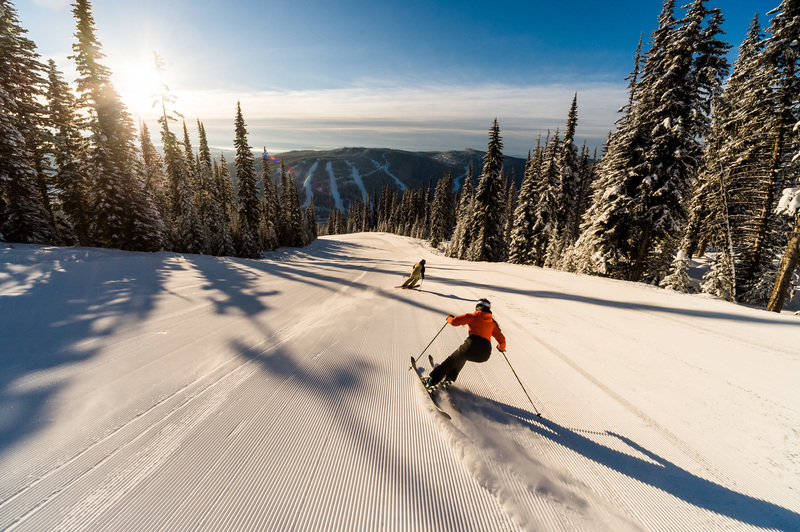 Unlike many BC resorts which were communities first and ski resorts second, Sun Peaks is a purpose-built tourism destination which is now also evolving into a community. “It’s cool, it’s giving the place character from this growing group of year-round residents,” Aidan says. “To keep up, we have to build more and have to do it in sustainable way so it doesn’t impact the destination in the longterm. We’re the second largest ski area in Canada, but not the second largest bed base – so we have the opportunity to build a lot more accommodation before the experience gets degraded.” The controlled recreation area is 10,000 acres so there is plenty of space for all this expansion. 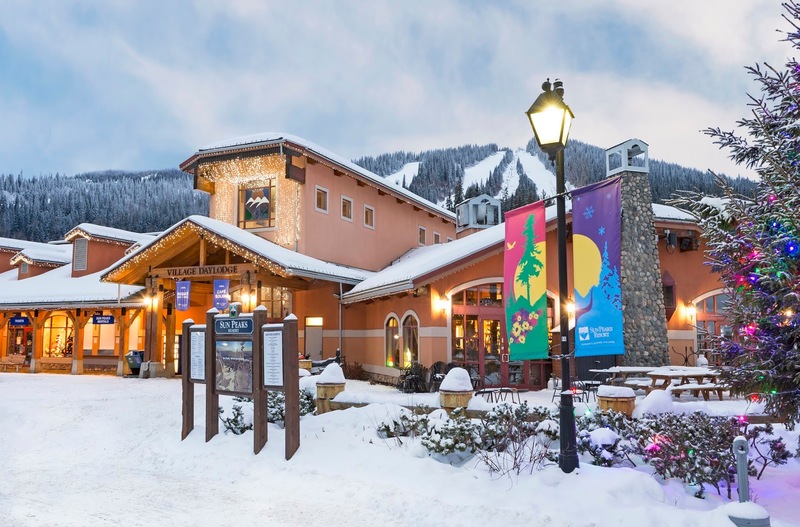 Although half the resident population is retirees, lifestyle relocators of all ages are attracted to Sun Peaks and one of the next projects under consideration is a co-working space. They’ve already got an Elementary School – ski in/ski out, like everything else in Sun Peaks, it is situated at the top of the magic carpet. With the school motto ‘Why walk when you can ski’, every day’s a snow day here. Second largest ski area in Canada! On average over 2,000 hours of sunshine per year!